The 2015 K9 Deluxe Mobile Grooming Van and Trailer Conversion has been introduced for those that prefer a more open layout. It comes with the new "faster heating system" as standard and is a fabulous entry-level conversion. It still has our fabulous 'K9 Warmline' fully insulated fibreglass lining with your colour choice non slip floor. 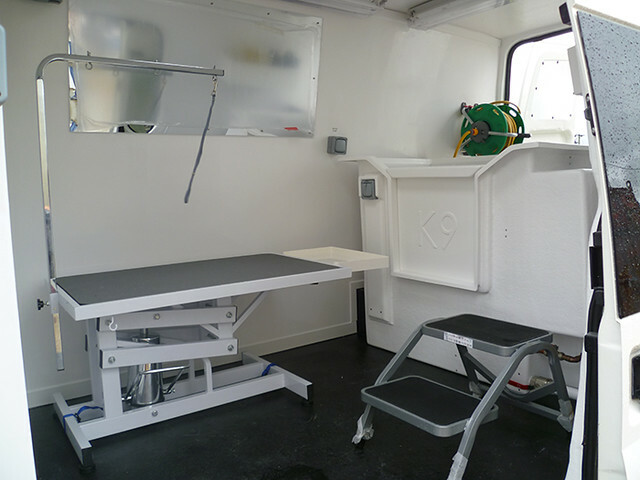 The K9 Hydrobath with insert table is fitted across the back of the van with a large fresh water tank behind this and LED lighting is standard. There are several optional extras you can choose to make your conversion unique to you including hydraulic & electric tables, blaster/dryers, air conditioning, skylight, music and many more.